If you do not have a seven decade Rosary, you can request one from Fr. Foss, or you can use a regular (Domincan) Rosary, and repeat two decades. These mysteries of Light, like the mysteries recommended by the beloved Pope John Paul II to be considered with the traditional rosary, are a meditation on the life and saving work of Christ. There are many different ways to understand how the Christian message is developed in the context of each person; we recall the words of St. Paul who said, “If we are saved by [Jesus’] death, how much more are we saved by his life?” Rom. 5:10. The mystery of how the light of the Christ enters, enlightens, and raises up each soul is a deep mystery which pertains to the depths of our being, and may manifest differently in each soul. 6. The Sacrificial Mystery of Eucharist. (Jn 6:54ff) Amen, amen I say unto you: the one that believeth in me hath everlasting life. I am the bread of life. This is the bread which cometh down from heaven; that if any one eat of it, the same may not die. I am the living bread which came down from heaven. The one who eats of this bread shall live for ever; and the bread that I will give, is my flesh, for the life of the world. Jesus said to them: Doth this scandalize you? It is the spirit that quickeneth: the flesh profiteth nothing. The words that I have spoken to you, are spirit and life. “And it was almost the sixth hour; and there was darkness over all the earth until the ninth hour. And the sun was darkened, and the veil of the temple was rent in the midst. And Jesus crying out with a loud voice, said: Father, into thy hands I commend my spirit. And saying this, he gave up the ghost.” […] And on the first day of the week, very early in the morning, [the women] came to the sepulchre, bringing the spices which they had prepared. And they found the stone rolled back from the sepulchre. And going in, they found not the body of the Lord Jesus. And it came to pass, as they were astonished in their mind at this, behold, two men stood by them, in shining apparel. And as they were afraid, and bowed down their countenance towards the ground, they said unto them: Why seek you the living with the dead? He is not here, but is risen […] And he led them out as far as Bethania: and lifting up his hands, he blessed them. And it came to pass, whilst he blessed them, he departed from them, and was carried up to heaven. of the promises of Christ. and keep us ever mindful of the Holy Word of God which binds us to thee and to all sentient creatures. 2. Then form a specific intention, and take a moment to focus on it: I offer this Rosary for the following intention (name your intention) and ask God’s blessing on it. 3. Then, announce the First Mystery and pray the Our Father on the single bead just before the medallion. Our Father who art in heaven, hallowed be thy name. Thy kingdom come, thy will be done, on earth as it is in heaven. Give us this day our daily bread, and forgive us our trespasses, as we forgive those who trespass against us. And lead us not into temptation, but deliver us from evil. 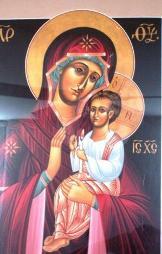 Our Mother, with us on earth, holy is your name, your true reign come, your will be done, within us, as it is within you. Give us this day our daily bread, and forgive us our sins, as we forgive those whose sins have oppressed us, and lead us not into confusion, but enlighten us with your wisdom. 4. Pray one Hail Mary for each of the ten beads. Hail Mary, full of grace, the Lord is with thee, blessed art thou amongst women, and blessed is the fruit of thy womb, Jesus. Holy Mary, Mother of God, pray for us* now , and at the hour of death. Amen. Glory to the Father, and to the Son, and to the Holy Ghost, as it was in the beginning, is now and ever shall be, world without end. Amen. Glory to you, O God, Living One, Word, and Spirit, now and for all ages and aeons. Amen. 6. On the single bead between the decades, announce the next Mystery and then pray the Our Father. Continue as in Step 3 for the remaining Mysteries. 7. After the last Mystery, pray one Hail Mary each on the fourth and third beads from the Cross to complete 72 years of Mary’s Life. 8. Pray the Our Father and the Gloria Patri for the intentions of all Christians on the 2nd bead from the Cross. 9. Pray a Hail Mary on the single bead closest to the Cross. Conclude with the Salve Regina. 10. While praying each decade, focus on the divine light which comes through each mystery. may be born in our Souls.